Folks, I am definitely proud to be an American. Sure this country has its share of problems but we also have a lot of freedoms that I’m thankful for! While I love to travel and visit other places, I can’t imagine living anywhere else but the good old USA. 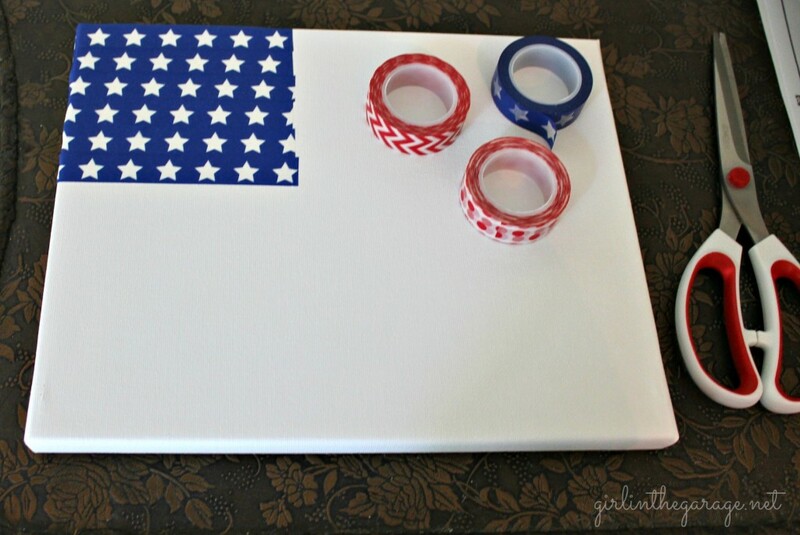 When I got an awesome deal on some washi tape from Pick Your Plum a couple weeks ago, I knew right away that I wanted to make flag art with it. It was so simple! Here’s how I did it. First I applied my star tape to the upper left section. Then I rotated the other strips on the remainder of the canvas. 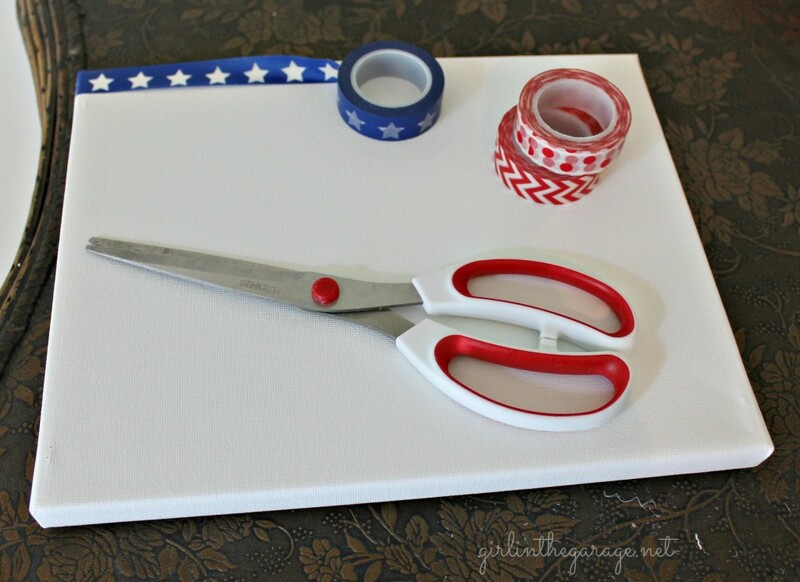 Finally, I applied the star tape along the outer edge. One of the reasons I like working with washi tape is that it’s so forgiving – if you mess up, just pull it up and reapply! 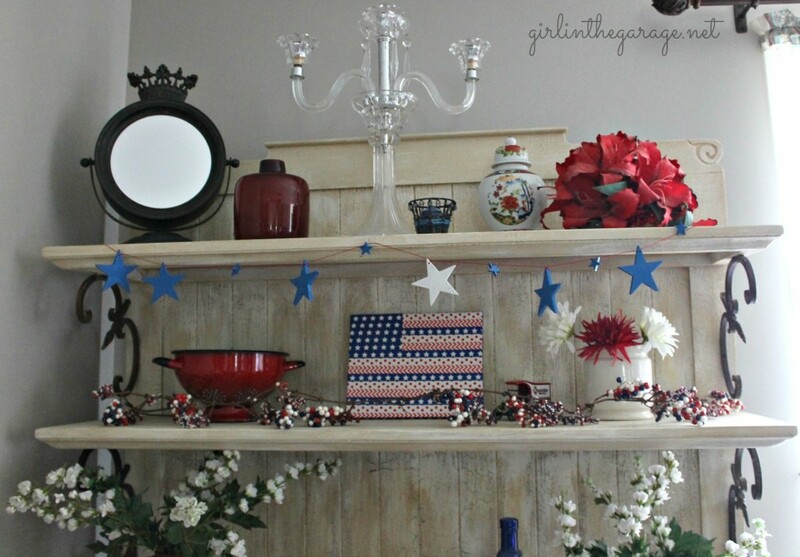 Probably the easiest craft I’ve done all year, and it looks so festive with the other patriotic decor on my hutch! 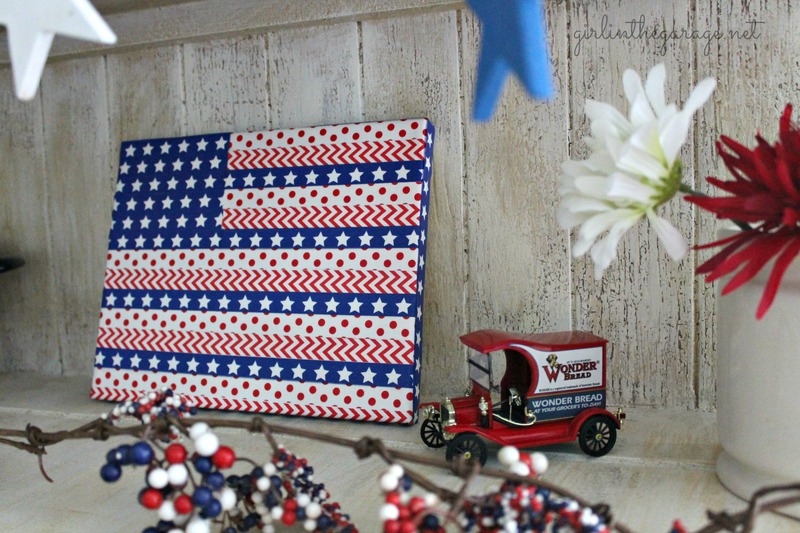 I hope all of my U.S. friends have a fabulous time celebrating our nation’s independence! I love washi tape…I have a slight addiction! This is really cute! I seriously JUST told a friend of mine the other day to try making a coaster that way with washi! So cool! I love how it turned out Jen! 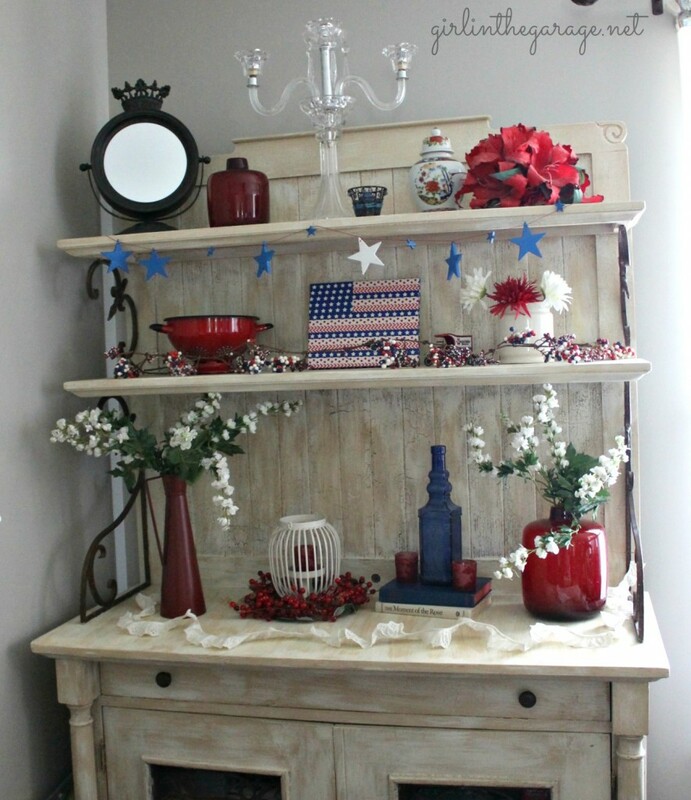 Your display looks great! Kirsten @ One Tough Mother recently posted…Erin Condren Life Planner Review + GIVEAWAY!! I love this, Jen!! It’s sooo cute. I recognize the red bouquet on the top shelf. What a wonderful day that was. Happy 4th to you, Scott, & the boys. Love y’all! I saw the title of your blog on a comment you left on someone’s post. Lately, I am a girl (woman) in the garage. I have been organizing my creative space and working on projects at the same time. By next week, my garage will be the best place to be creative. Love the washi flag tape! Washi is amazing! Thanks for linking up to Monday Funday! Nancy @ Artsy Chicks Rule recently posted…“Coffee Bar” Server w/Shelves – It Moved! Thank you Mandy – that’s so exciting! 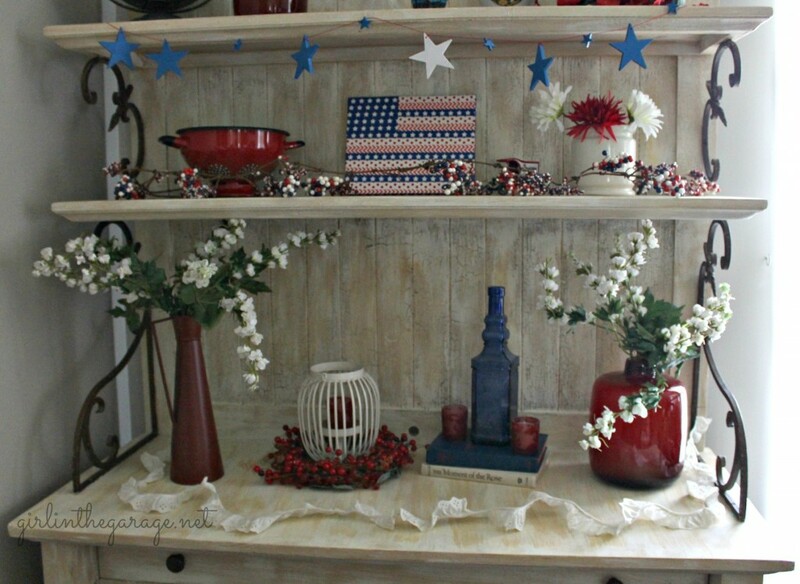 Brenda @ Chatting Over Chocolate recently posted…SIMPLE & INEXPENSIVE 4th of July Flag Table Decor! Thank you so much Brenda- I’m glad you stopped by!